We live our lives at the mercy of chance, and it's sometimes not what we say but how we say it and who we say it to that unexpectedly shapes our fate. This is certainly the case for Jonathan Zimmermann, a Hamburg picture framer with an eye for art, who at an auction meets and declines to shake the hand of a man he is introduced to. "I've heard of you," he tells him. Quite what he's heard is uncertain, but the inference is that it's not that good. This simple rebuff sets in motion a series of events that are to drastically change his life, or at least what remains of it. Jonathan, you see, has a rare blood disease, one that looks set to kill him in the not too distant future. Treatment is expensive and he has a wife and two young children to support and no way to effectively provide for them after his death. Then one day he is approached by a Frenchman named Gérard Blain, who offers him a considerable sum of money if he'll kill two people for him. Someone bad, he is assured, someone who has it coming. Blain knows all about Jonathan's illness and has arranged for him to see an American specialist in Paris, to get a more detailed and honest evaluation than the inconclusive feedback he has been prising from his own doctor. Jonathan meets with the specialist and the prognosis is grim. He decides to accept Blain's offer and carry out the first killing (the deal actually requires two), but can this mild-mannered picture framer really take the life of another so easily? While he is deliberating on this, he is visited at his shop by the very man whose hand he earlier declined to take, an American sporting a cowboy hat and a not-so-good command of the German language. His name is Tom Ripley. Aha. Those of you approaching Wim Wenders' gripping 1977 thriller The American Friend retrospectively may well have heard that name before. A key character in five novels by writer Patricia Highsmith (the series became known as 'The Ripliad'), Tom Ripley is one of modern literature's most compelling antiheroes, a likeable but completely amoral con man who is occasionally given to murder and always escapes justice. His first appearance is probably his most famous, The Talented Mr. Ripley having been made into two successful films, by René Clément in 1960 as Plein soleil with Alain Delon in the title role, and by Anthony Minghella in 1999 under its original title with Matt Damon as Ripley. Here he is played by Dennis Hopper, an inspired piece of casting that may not be completely true to Highsmith's original, but that perfectly captures the blend of relaxed charm and amoral deadliness that was always what made Ripley such a fascinating literary character. Despite making the film on the back of his wild turn as the spaced-out photographer in Apocalypse Now and in the second half of a decade spent largely in a self-confessed drug haze, this is one of Hopper's most subtle and nuanced performances, and demonstrates just how fine an actor he really was. While not the central character here, Ripley is nonetheless the driving force of the plot, the catalyst for the misadventures that are visited on the unfortunate Jonathan. As played by the excellent Bruno Ganz, Jonathan is an easy figure to connect and empathise with – affable, easy-going and a little too trusting, he's driven by good intentions rather than greed or malice. Ganz brings a warmth and humanity to a role that on paper is a potential downer – after all, he starts the film with a death sentence hanging over him and things just go downhill from there. 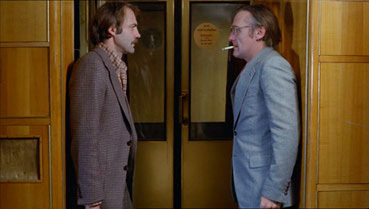 Strongly character-driven though it may be, Wenders never forgets that he is making a thriller, and in Jonathan's two contract hits clearly demonstrates that he can wind up an audience with the best of them. Both sequences are structured around train journeys (something of a Wenders signature), the nervous uncertainty of the first station hit giving way to a bravura sequence aboard a moving express train for the second, where Ripley's perfectly timed reappearance expose his true colours to Jonathan and strengthening the bond that has been growing between them. It's this developing friendship that provides the film with its heart, the on-screen chemistry between Ganz and Hopper igniting their every encounter and injecting unexpected moments of humour into scenes that would elsewhere be played with the sternest of faces. 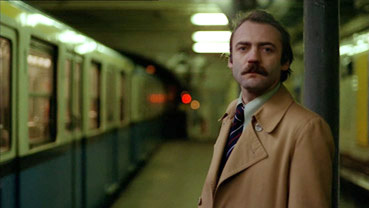 As you'd expect with Wenders, the small detail provides its share of delights, from the casting of film directors such as Nicolas Ray, Sam Fuller and Gérard Blain in the bad guy roles to the offbeat moments that enrich familiar scenes: Jonathan briefly dozing off and almost losing the man he is supposed to kill; the train passenger who is denied entrance to the toilet in which Ripley is hiding a body and who borrows Jonathan's whisky to wash down her tablets; Jonathan anticipating his own impending death with a garrotte and a silenced pistol; the quietly captivating moment in which he lines the palm of his hand with gold leaf. The American Friend is a fascinating cross cultural piece, a European-set American novel that has been developed into hybrid cinema, its multi-national cast and bilingual dialogue appropriate to a film with distinctly European sensibilities and pacing, but whose chase sequences are as breezily cut and incident-packed as any of its Hollywood contemporaries. Aided immeasurably by some fine work by regular collaborators Robby Müller (cinematography), Peter Przygodda (editing) and Jürgen Knieper (music), Wenders delivers a brooding and compelling blend of character study and noir thriller, and one that in a time of paper-thin plots, multi-angle coverage and machine-gun editing, has stood the test of time handsomely. A strong anamorphic 1.77:1 transfer that nicely captures Robby Müller's gorgeous lighting camerawork, which alternates between the naturalistic and the expressionistic, where coloured lighting is used to suggest mood and intent. Sharpness is fine with no obvious enhancement, and the contrast levels and shadow detail are very good, coping well with the varying light levels and Müller's placement of characters against brighter backgrounds. The standard Anchor Bay/Wenders soundtrack options of Dolby 2.0 and 5.1 are on offer, the 5.1 actually using the surrounds for location effects for a change, albeit subtly. The disc included in the Wim Wenders Collection is exactly the same as the one already released as a stand-alone by Anchor Bay, and comes complete with its extra features. All of the Wenders commentaries I have heard have proved enthralling and this one is no exception. As ever we learn a lot about his influences and the making of the film, including some choice technical details and information on the actors. Dennis Hopper has less to say but makes some very worthwhile contributions and both men have some enjoyable anecdotes that are not always directly related to this film – Wenders tells a nice story about John Ford and John Huston, and Hopper talks about working with Nicolas Ray on Rebel Without a Cause. 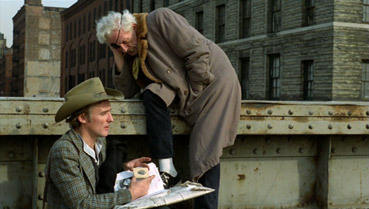 Wenders' story of how his career was turned around by Sam Fuller after a viewing of Paper Moon had convinced him that Alice in the Cities was no longer worth making (Wenders felt it was essentially the same movie and that Bogdanovich had beat him to it) paints Fuller in a particularly glowing light. A lot of ground is covered here, from Highsmith's initial and later reactions to the film to a discussion about Bruno Ganz that laments his abandonment of cinema after repeatedly failing to find decent roles. The commentary was recorded, of course, before the worldwide acclaim for his superb performance as Adolf Hitler in Downfall. Both men are admirers of the work of the other, leading to a small bit of back slapping and a parting comment from Wenders to the effect that "I think we are the founding members of our mutual admiration club." A number of deleted scenes and single shots are strung together here, some of which – notably sequences involving Ripley's housekeeper (removed to suggest he lives alone) and Marianne's work as an actress and dubbing artist – are of considerable interest. These can be played with optional commentary from Wenders, who doesn't have too much to say, supplying brief explanations as to why scenes were cut but also pointing out the obvious in places. A short snip of behind-the-scenes footage leaves him a little baffled. The picture quality here is close to that of the main feature and is anamorphically enhanced. This appears to be original German trailer, unhurriedly edited and not that seductive. The film could be sold better. Impressively detailed and interesting biographies for Dennis Hopper, Wim Wenders and Bruno Ganz. On the face of it, one of the best specified discs in Anchor Bay's Wim Wenders Collection, but this is the very same disc that has been available as a stand-alone for 4 years now, and one most Wenders fans will surely already own. If not, or if you're new to Wenders' work, then it comes recommended, for the transfer, for the extras, and for the film itself, which remains one of my favourite of the director's works, and losing out only to René Clément's Plein soleil as the best Tom Ripley film to date.